The ruling Awami League (AL) is observing its arch rival BNP’s activities over its jailed chairperson Khaleda Zia’s release from jail. The AL top leaders apprehend that BNP leaders and workers can again create anarchy in the country in the name of a movement for the release of Khaleda Zia, who has been in jail since February 8, 2018, after being convicted of corruption. 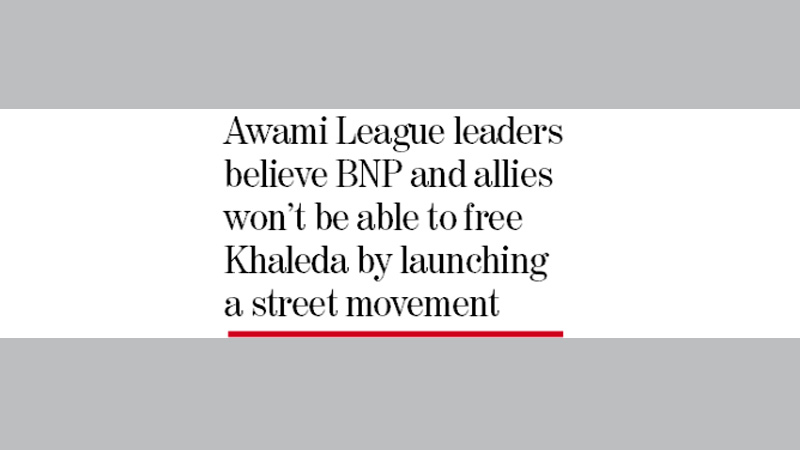 But the ruling party top brass believe that the BNP and its allies would not be able to release its chief from jail by launching a movement in the streets. Meanwhile, BNP leaders and workers want to release their leader through a tougher movement that forces the government to release her and provide proper treatment. The party already plans to take to the streets to force the government to release Khaleda Zia. BNP and its allies on Sunday organised a token hunger strike in the city, demanding the unconditional release of Khaleda Zia and ensuring her proper treatment by admitting her to a specialised hospital. 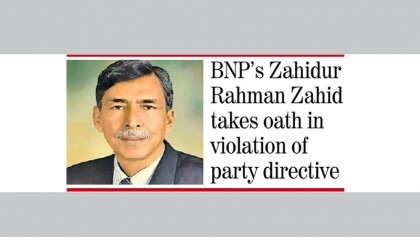 Talking to The Independent, the BNP rank and file emphasized the need to immediately launch a united movement to force the government to free the ailing BNP chairperson Khaleda Zia and provide her proper treatment in a specialized hospital of her choice. The party would soon take to the streets and hold demonstrations to create an atmosphere for the former premier’s release, they said. The leaders said that since Khaleda did not get bail in the last 14 months after she was sent to jail in a graft case, the now realize that launching a movement to free her was their only option. BNP standing committee member Dr Khandaker Mosharraf Hossain said they would go for a movement to free the party chairperson. The party will soon decide the new course of action to force the government to free the chairperson who has been deprived from her right to get bail, he said. BNP vice chairman Shamsuzzaman Dudu alleged that the government had brought the issue of parole for Khaleda Zia in public to undermine her and divert the attention of the people. “She (Khaleda) had been sent to jail in a false and politically motivated case and is being deprived of her right to obtain bail,” he said. The BNP leader said the party leaders were discussing the possible course of action to stage demonstrations in the city and elsewhere in the country to put pressure on the government to release the BNP chief. He emphasized the need to launch a united movement taking all the political parties under the umbrella of Jatiya Oikyafront and 20-party opposition alliance. BNP joint secretary general Advocate Mujibur Rahman Sarwar said they would go for a movement along with carrying out legal battle to free Khaleda Zia. An environment has to be created by waging movement so that the government is compelled to free her soon. We need a united movement across the country to free the party’s ailing chairperson, he said. Besides, talking over the issue AL acting general secretary Mahbubul Alam Hanif said BNP would not be able to release Khaleda Zia from jail through a movement. There is no way except a legal process, he added. He said BNP’s movement would not yield any result as the country’s people were not with them. BNP leaders had called for a movement in the past several times but the people didn’t respond to their call. So, if the party again tries to create anarchy in the name of movement, people will resist them unitedly, he added. When contacted, AL joint general secretary Abdur Rahman said Awami League is not worried about the BNP’s threat to wage a movement to force the government to release Khaleda Zia but they remain alert on BNP’s activities. “We hope Khaleda Zia will get justice from the court. I don’t believe that BNP will be able to release its chief from jail through a movement. BNP leaders will have to free their leader through a legal battle, not movement,” he told The Independent. The BNP has been accusing the government of neglecting her treatment and demanding that she be moved to a specialised hospital. Khaleda was shifted to Bangabandhu Sheikh Mujib Medical University (BSMMU) on April 1. BSMMU director Brig.-Gen. Dr AK Mahbubul Hoque had told the media that she was suffering from severe pain in the joints of her hands and legs. Khaleda was very weak as she could not take food or sleep well. Her sugar level was also high, the doctor had said. BNP leaders criticised the government for taking Khaleda to BSMMU despite their repeated requests to allow her treatment at a specialised hospital. The party leaders believe that she will not get proper treatment at the state-controlled hospital.